Robert Kelly has overcome many hardships in his life, all of which have made him the actor/comedian he is today. 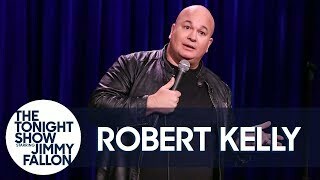 From his early days as a kid growing up in Boston, in and out of Juvenile Hall, Robert’s unique, honest take on his own life and his relationships makes his comedy clever, abrasive, funny, yet refreshingly vulnerable. Robert has been winning over audiences for the last 18 years. In addition to clubs and colleges nationwide, Robert has traveled across the country in the “Tourgasm Live” tour, and is a regular on the Opie and Anthony radio show. He has performed at the Just For Laughs Festival (Montreal 2010 & 2008), the South Beach Comedy Festival, HBO’s Comedy Festival (Las Vegas), and the HBO US Comedy Arts Festival (Aspen 2007). In 2009 he performed in front of over 1 million people in 80 arenas across the country as a feature on the “Isolated Incident Tour”. Robert’s extensive TV comedy credits include the recent Comedy Central Special “Comics Anonymous”, “Comedy Central Presents” (Comedy Central), “Tourgasm” (HBO), “Jimmy Kimmel Live” (ABC), “Premium Blend” and "Tough Crowd with Colin Quinn" (Comedy Central), "The Carson Daly Show” (NBC), “Awesomely Oversexed” (VH1) and “The Jim Breuer Show” (MTV). His acting credits also include Louie CK’s brother (Robbie) on the new “Louie” show (FX), Law & Order” (NBC) “Law & Order: Special Victims Unit” (NBC), and he appeared as a detective playing opposite Vincent D’Onofrio on “Law & Order: Criminal Intent” (NBC) and a guest starring role on "The Job" (ABC) with Denis Leary. Robert’s movie credits include “Ghost Town” (Dreamworks SKG 2009), “What Doesn’t Kill You” (Battleplan Prods 2009), Children of Invention (Sundance Film Festival 2009), “Bachelor No. 2” (Lionsgate 2008), and “Good Luck Chuck” (Lionsgate 2007). He also just finished producing and starring in his first short film “Shooting Angles”. Robert currently lives in New York City with his wife and their two dogs.